The vast majority of my investment portfolio is made up of passive index tracking funds. Why? Well as a person who’s now been investing heavily for a bit over 7.5 years I personally believe this is the best way for me to achieve my wealth ambitions. One exception to this is my High Yield Portfolio (HYP) which is held within the Equities portion of my portfolio and can only be described as active investing. So if I'm a tracker believer what am I doing actively investing I hear you ask. Simply, while 99% of my investing is all about non-emotional investing my HYP is an outlier as it’s there for psychological reasons. I’m now fast approaching optional very early retirement and when in that retirement I’m going to be likely 100% living off my wealth. I’m going to do this by drawing down from my wealth at the rate of 2.5%. I have two ways to do this – spend dividends/interest and/or sell down capital. For me, particularly in a severe bear market, I think that spending dividends/interest will psychologically be far easier and less disruptive to life than being forced to sell down capital. With that in mind before retirement I’m trying to ensure that the dividends/interest I receive annually is as close to 3% of wealth as possible. If I can achieve 3% in the good times I can draw down 2.5% and reinvest 0.5% and in the bad times I have some buffer to allow for dividend attrition. This psychological advantage is however a fool’s errand if it causes my total portfolio to underperform the market. Unemotionally what matters is Total Return which is Capital Appreciation plus Dividends. So with this in mind I watch my HYP performance, particularly capital gains, like a hawk. So as we pass the mid-year point of 2015 let’s take a look at my HYP's performance to date. 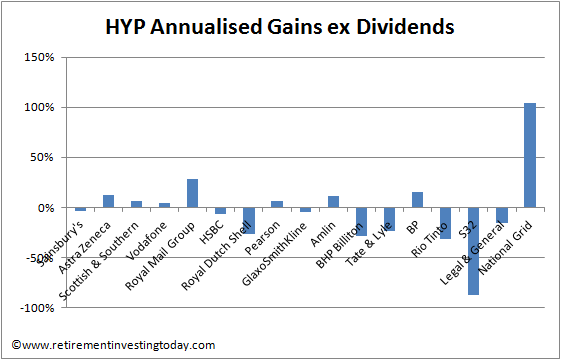 Firstly to what the HYP is all about – Dividends. Performance here is still very good with the portfolio currently sitting on a trailing yield of 5.2% which is 1.4 times the FTSE100’s 3.6%. So far so good. Now let’s look at the risk associated with buying big, boring, non-cyclical industries – Capital Gains. Since inception in November 2011 this is also ok. The HYP has returned a gain of 31.0% vs the FTSE100’s 25.6%. Where it gets interesting though is year to date gains to today. Here the HYP has fallen by 1.7% vs the FTSE100’s gain of 1.6%. So long term Total Return is ahead of my FTSE100 proxy but year to date I've fallen behind. Miners like BHP Billiton and Rio Tinto as well as Royal Dutch Shell have certainly put a big drag on the gains. Is this the start of long term under performance? I honestly have no idea but what I do know is that this underperformance has only occurred over the last 6 months and my investing timeline is 40 years or more so I'm going to stay with it a little longer. The National Grid business model is easy to understand. They develop and operate safe, reliable and sustainable energy (electricity and gas) infrastructure in both the UK and the north eastern US. I prefer large and non-cyclical industries. Its company number 19 in the FTSE 100 with a market capitalisation of £31.7 billion and generates £3.8 billion in revenues. It also looks to be a non-cyclical company and was actually able to raise its dividends in each year between 2007 and 2010. Just the sort of company I want as a retiree in a crisis. Additionally while the FTSE 100 was busy falling 43% during the Global Financial Crisis National Grid took less of a hit falling 36%. 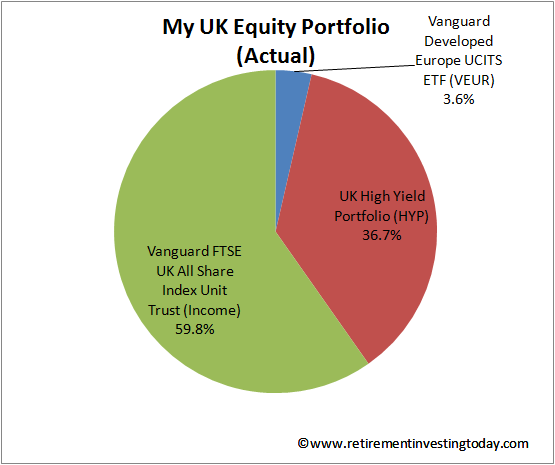 To minimise risk I'm looking for my HYP shares to be spread over a number of sectors. NG does give me some duplication with SSE. 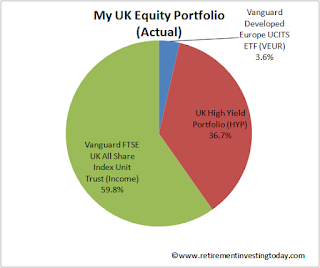 I'm looking for shares with dividend yields somewhere between the current FTSE 100 yield of 3.6% and 1.5 times the FTSE 100 yield or 5.4%. On a trailing yield of 5.0% NG is in spec with forecast dividend yield near the top end at 5.2%. A dividend cover of greater than 1.5 for all HYP type shares except utilities where I think that greater than 1.25 is ok. Here NG is ok at 1.4. ‘Creative accounting’ can make earnings and hence dividend cover look good. I therefore also set a greater than or equal to 2 criteria on Operating Cash Flows compared to Dividends. At 3.1 NG easily meets the criteria. Valuations are a P/E ratio of 14.7 and a Price/Book ratio of 2.7 so certainly not a bargain. 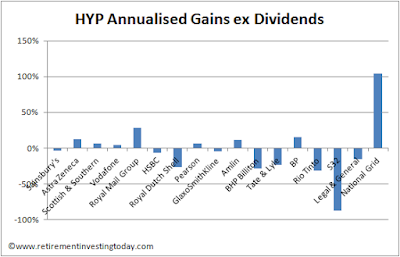 To conclude the chart below gives a quick glance of the annualised capital gains of all of my HYP shares. The chart moves from my first purchases (SBRY, AZN, SSE) in November 2011 on the left to my last purchase (NG.) on the right. The variability remains quite incredible. Hi RIT, you're a very sensible chap so I'm sure the odds of you canning your HYP efforts just because of weak year-to-date capital gains are about zero. Even underperformance over 5 years is unlikely to be statistically significant, i.e. could be luck as much as risk. So don't throw in the towel just yet! In my equity portfolio just about all of the higher-yielding shares of all sizes of market capitalisation have lost capital value in the year to date. I conclude that this is because markets are adjusting to the expectation of higher interest rates. In those circumstances, companies with high debt levels are sensitive to anticipated increases in debt servicing costs. National Grid is one such company, hence its decline in share price year to date. I hold NG but now is not the time to add, IMO. I should add that my pf is aimed at growth as well as income and that I do adjust holdings in the light of macroeconomic circumstance as well as stock picking. Overall the pf is up 7% year to date and yields roughly 2.5% on top. As someone who has the majority in tracker funds do you find the HYP more engaging/interesting? I remember a while back you posted about how boring the mechanical nature of index investing was becoming. Worth losing out on some Total Return if it keeps you investing? Like you, most of my investments are in tracker funds but I now have a small portfolio of shares. I think there were two reasons why I started buying individual stock. 1. As you say, spending dividends/interest is psychologically easier than selling off fund capital. Whilst I don't intend to have dividend income covering all my expenses, if I got enough to cover say the main utility bills, that will be good enough for me! 2. Passive investing is boring. Yes, I know it should be boring - invest and forget and all that, but a little bit of active investing keeps me (even more) interested in saving for FI. NG is a great buy, one that I hope to add at some point to my portfolio. Yes, i think that BHP and RDSB are acting as a hefty drag in many people's portfolios. However, long-term I still see them doing well. After all, they are both still giants in essential industries. You're absolutely right about the psychological dimension of selling down capital as opposed to drawing on dividends. Being aware of that and preparing in advance for it is very wise indeed. Your HYP performance is very good indeed, considering. You must be pretty chuffed with it!